Since June 2017 Solarpraxis Engineering GmbH has expanded its business activities by EPC. 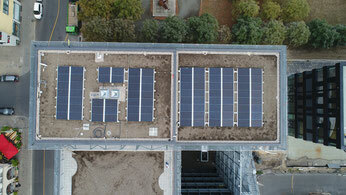 Solarpraxis Engineering is registered at the Berliner Chamber of Crafts and at the local grid operator, Stromnetz Berlin, with concession for installation of PV systems. We mount turnkey PV systems. Starting with the grid request, we take over all agreements with the local grid operator. Our electricians have the authorization to connect to the grid and hence we also provide commissioning of the PV system. Furthermore we can reconstruct existing PV systems, that means to renew or repair defect components. This comprises repowering, where parts are exchanged by components with higher quality or the installed power is increased by additional modules. For our clients we provide detailed documentation of the PV system and technical data of all components including drawings and all necessary assessments and statements.